When I was in seminary we had all sorts of assignments that were designed to get us engaged with scripture. When I took a class on the gospel according to Mark, I was required to read all 16 chapters out loud, in my spare time, at least once a week. When I was learning about biblical Greek, I was tasked with memorizing the Lord’s Prayer in Greek and I would mutter it under my breath everywhere I walked on Duke’s campus. And when I was enrolled in a class on the art of preaching, I had to work with a group to come up with a strange and exciting way to bring a scriptural text to life. My group broke up parts of the worship service; one person would do the call to worship, one person would lead the rest of the class in singing a few hymns, one person was responsible for all of the prayers, and I was assigned the “sermon” section. Rather than waxing lyrical about the particular text (Jesus’ Transfiguration) we agreed that I should just retell the story in an exciting and dynamic way. I prayed over the text during the days leading up to the worship service and decided that I would tell the story of Jesus’ Transfiguration from Peter’s perspective, from the future looking back on the incredible event. Like a lot of group of assignments, it felt like everything was just thrown together, but we were confident that God could make something out of our worship. When the day of the assignment arrived, everyone in the group nailed their respective parts and I eventually had to stand before the gathered class and give my rendition of the Transfiguration. As I went on and on as an older Peter remembering the past, I could tell that the class was starting to lose interest, so I started elevating my volume and delivery. I began building the story up through a crescendo until that pivotal moment when Jesus was clothed in white and everyone in the room went wide eyed. I, at first, thought that my command over the scripture had blown the class away, but I soon realized what had happened: While I was talking, one of my peers had slowly started to dim the lights in the room until it was rather dark (I was so focused on what I was saying that I didn’t even notice it). But then at the exact moment I described the dazzling whiteness of Jesus’ garment, she turned on the projector and I started to glow. Transfiguration Sunday is an important event in the liturgical calendar as we bask in the glory of Christ right before we enter the season of Lent on Ash Wednesday. Important for us is a willingness to be knocked back by the dazzling power of Jesus’ life and work. We take the time to be blown away, just like Peter was, by how God’s love really knows no bounds. This week, as we prepare to celebrate the Transfiguration, let us look for moments where God’s glory shines in our midst. We might see it in a perfect sunset, the laughter of a child, or in the still small silence of prayer. And whenever it happens, let us give thanks for the glory of the Lord. The earth is the Lord’s and all that is in it, the world, and those who live in it; for he has founded it on the seas, and established it on the rivers. Who shall ascend the hill of the Lord? And who shall stand in his holy place? Those who have clean hands and pure hearts, who do not lift up their souls to what is false, and do not swear deceitfully. They will receive blessing from the Lord, and vindication from the God of their salvation. Such is the company of those who seek him, who seek the face of the God of Jacob. Lift up your heads, O gates! and be lifted up, O ancient doors! that the King of glory may come in. Who is the King of glory? The Lord, strong and mighty, the Lord, mighty in battle. Lift up your heads, O gates! and be lifted up, O ancient doors! that the King of glory may come in. Who is this King of glory? The Lord of hosts, he is the King of glory. When the morning arrived I was filled with excitement. I picked out the perfect bow tie to go with my blazer, hoping to assert my authority regardless of my young age, I had a prepared a theologically profound manuscript sermon, hoping that it would get people to shout “amen!” from the pews, and I spent the long drive down Woodward Avenue in silence, hoping to boost my holiness before the service began. The closer I got to the church, the stranger I began to feel. I hadn’t noticed it at first, but the longer I drove, the less people I saw on the streets. The buildings went from inviting homes and businesses to abandoned shells of carpentry. The streets went from well maintained to pot holes that required a car to drive up on the sidewalk in order to avoid. In a matter of minutes I had gone from “Pleasantville” to a post-apocalyptic movie set, and my excitement was quickly replaced by fear. By the time I pulled in the parking lot, I realized that I hadn’t seen another human being for at least ten minutes. The streets had been largely deserted leading up to Cass UMC, and it was strangely silent when I stepped out of my car. So here I was, standing in the heart of Detroit, in a bowtie and blazer, with a bible and sermon tucked under my arm, completely alone on a Sunday morning. My footsteps across the concrete reverberated in echoes through the abandoned buildings flanking the church and even though it was a bright sunny day, I felt like I was walking down a dark alley in the middle of the night. The building itself was an architectural masterpiece having been built in 1883 with Tiffany’s stained glass windows, though I could tell from the street that bullet holes had cut through the once remarkable windows. When I reached out my hand to open the doors, the height of my new fears were realized: It was locked. I knew no one from the church, I had no way to contact anyone, and all of the warnings started to really flow through my mind. But I did what any good pastor would do, I sat down on the front steps and waited for someone to open the door. 30 minutes later, a disheveled looking old man, the first person I had seen in a long time, peeked from around the corner, walked up the steps, and unlocked the front door without saying a word. I wandered around the building until I found the sanctuary, searched in vain for a worship bulletin, and resigned myself to sit down in a chair by the altar. During the next hour, the most random assortment of people started flowing in through the sanctuary doors. 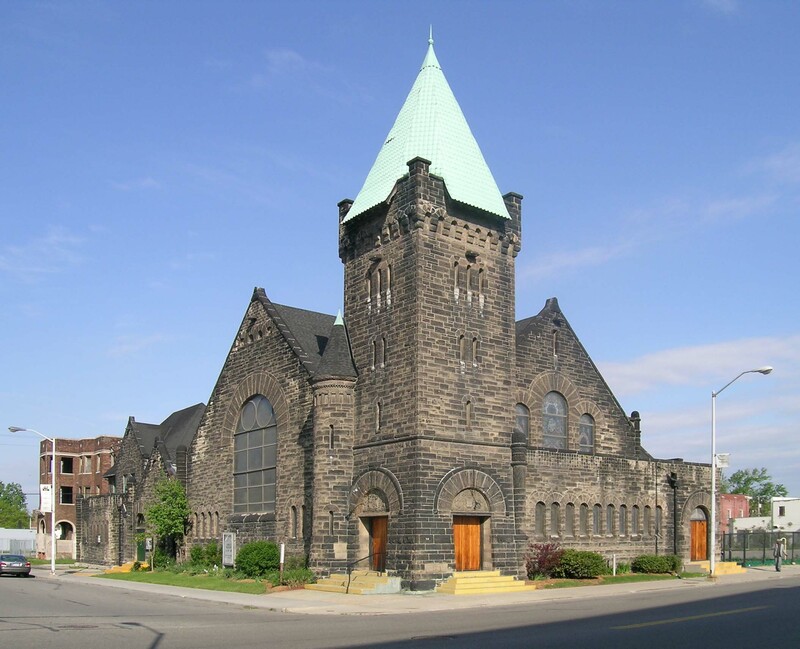 The church, once renown in the heart of Detroit, was being filled with people who slept outside the night before, people who had no money to put in the offering plate, and people who were having conversations with themselves at a volume loud enough for everyone else to experience. A group of 7 older black women arranged themselves on folding chairs near the front, and without really discussing it they all flipped their hymnals to the same page and started to sing. A man with wrinkled fingers was hunched over a piano in the corner struggling to keep up with the singing, and a young man had seated himself behind a drum-set hidden in the corner, and was wailing away to a song that only he could hear. The earth is the Lord’s and all that is in it, from the sea to the mountains, from the rivers to the deserts, from the people to the animals; for the Lord has founded life upon the earth. Who then shall worship the Lord in holiness? And who shall stand with the Lord in the holiest of places? Only those who have clean hands, and pure hearts, those who do not lift up their souls to what is false, who do not break their promises. They will receive a blessing from the Lord, and vindication from the God of their salvation. Such is the company of those who seek the Lord. I took off the jacket and tie, rolled up my sleeves, ditched the sermon on my chair, and let the Holy Spirit go to work. It was only after a few moments of silence that I finally said “amen” without having added any of my own prayers. Lift up your heads, O gates! Open up you ancient doors! the King of glory is coming. Who is the King of glory? The Lord, strong and mighty, merciful and majestic, the Lord. Jesus Christ the author of salvation, the Good News, the Messiah. The Holy Spirit full of wisdom and truth, giver of life, and partner to our prayers. Lift up your heads, O gates! Open up you ancient doors! The King of glory is coming! Who is the King of glory? The Lord of hosts, he is the King of glory. We can dress the part, we can read all the right books, we can memorize all the hymns and prayers, but unless we are looking for holiness in our lives, unless we are ready to bow down to the King of glory, then we are forgetting the truth: God is God and we are not. Many of us are good Christians, we pray for our friends and family, we come to church, we put money in the plate, but there is a profound difference between believing we are holy, and wanting to be holy. When I arrived at that church in Detroit years ago, I foolishly thought I was bringing something to them. With my well prepared outfit and sermon, I made the assumption that I was bringing God with me, nice and shiny, like a school project. I became my own main character in the story of worship, and it prevented me from seeing the King of glory. When I stood up in the pulpit to proclaim the words, the people did not see a young man with a seminary education, they did not see some white fool trying his best to not pass out, they saw a vessel for the Lord. Their prayers were not to me, but for the Lord to work through me. The recognized the great division between God and me, and knew that Jesus was the bridge between the two. They knew that God is God and we are not. In our contemporary American culture, we tend to view ourselves as the center of the universe. We assume that everything revolves around us, and that so long as our needs are being me, then everything else should be fine. We believe that if we wear the right clothes, and get the right education, that holiness will follow accordingly. We feel holy for giving up an hour every week to sit in a place like this and sing hymns, offer prayers, and listen to a sermon. That church in Detroit had something that I never knew I needed: They believed that God was the center of the story, that God had the power to transform their lives, and that God really was the King of glory. Too many of my friends have left the church because they “didn’t get anything out of it.” They might try different styles of worship and different denominations, but if they don’t get anything out of it, they will rarely return. However, church isn’t about what we get out of it, its about what God gets out of us. Believing we are already holy limits God’s power to make us holy. It is in the recognition of the great divide between humanity and the Lord that we can let Jesus get to work on our hearts and souls. It is in the great admission of Jesus as the King of glory we start to see ourselves, not as the center of the universe, but instruments for God’s love to be heard in the world. It is in the words of our worship that we recognize the Holy Spirit’s movement in our midst and our lives start to change. If we remain in the assumption of our holiness, then our lives will stay the same. But if we truly desire for the Lord to make us holy, then our lives will be transformed. Amen. Do not love the world or the things in the world. The love of the Father is not in those who love the world; for all that is in the world – the desire of the flesh, the desire of the eyes, the pride in riches – comes not from the Father but from the world. And the world and its desire are passing away, but those who do the will of God live forever. “Taylor, the bishop is appointing you to St. John’s United Methodist Church in Staunton, Virginia. We believe the church fits with your gifts and graces and we are excited to see what the Holy Spirit can do through you there.” Those were the words used to let me know where I would be spending the next few years of my life. I remember how I felt with the phone next to my ear and Lindsey by my side when I found out that I would be coming here to serve this church. Obviously, for the next few days all I could think about was the church and the community. What would you all be like? Would we enjoy living here? What would we do for fun? How would you respond to me as your pastor? Of course I Googled the church, searched the church name in the local newspaper databases, and even looked up the address of the parsonage. And for as many things as I could discover, more questions began to develop to the point where I had to just stop and accept that this is where I was going. However, one question remained in the back of my mind during the months leading up to my first Sunday. I was fine letting everything else go, I was content with the unknown, except for one thing: Why St. John’s? Now I don’t mean why this church out of all the churches in the Virginia conference, though I have wondered about that at times. What I mean is this: Why is the church named St. John’s? Do any of you know? Church naming often carries an interesting history. Like when a group of people from a Baptist church grow frustrated with another group and decide to leave and start a new church with the ironic name of Harmony Baptist. Or like what we have here in town with 1st Presbyterian, 2nd Presbyterian, 3rd Presbyterian, etc. I would love to know the story behind that. Anyway, why are we called St. John’s? The story goes that a long time ago there was a particularly advantageous District Superintendent who dreamed of 4 new churches in the Staunton District. The population was booming in the valley and he believed it was time for the Methodist Church to start breaking ground and forming church homes for new people. He wanted 4 new churches and he wanted them to be named after the gospels: Matthew, Mark, Luke, and John. Though only two of them ever came to fruition: Mark and John. Now, is that really how we got our name? I have no idea, but thats the story everyone seems to tell. I want to know if thats the story we want to tell. That the name of this blessed house of the Lord got its name from some guy in the past who wanted to leave his mark in Staunton. Or do we want to take ownership of our name, and live into the reality of what it means to be St. John’s? Our name is part of who we are, it is a part of our very identity, for better or worse. If we were First UMC I would expect that we were the first to break ground in Staunton, that we would be leading the community in what it means to love one another. If we were Harmony UMC I would expect a church full of people who agreed on everything all the time, no matter what. If we were Wesley UMC I would expect that John Wesley would be fundamental to our mission and work in the kingdom. But if we call ourselves St. John’s, then who are we? 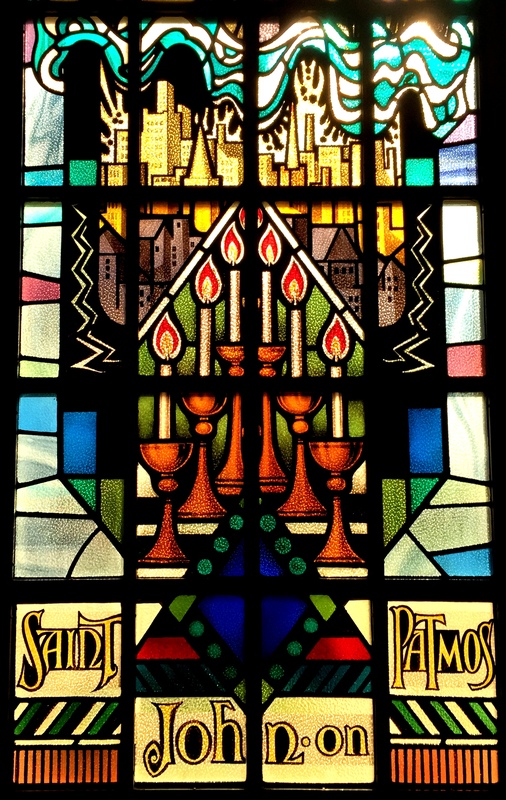 On the right side of our sanctuary we have three stained glass windows that I call The Johns. We have John the Evangelist, John of Patmos, and John the Presbyter. Do they represent three different and distinct men? Are they in fact all the same person, just being shown throughout the different decades? Early Christian tradition held that John was one of the original 12 disciples who actually lived a long life and was not killed for his faith like the others. It is believed that he was responsible for writing the gospel according to John, the letters 1-3 John, and the final book of the New Testament Revelation. Of course modern scholars debate as to the particular authorship and whether or not one man was responsible for all of these different writings. What is important for us is the fact that we affirm all of the writing as canon and life-giving, that Christians for centuries have come to discover the living God in the words attributed to John, and that we will continue to live into our discipleship through them. Our first window displays the young John as the Evangelist. Today when we hear the word evangelism we tend to picture people converting others to follow Christ, but in its most simple meaning, an evangelist is someone who shares the Good News, and in this case, it came through a written account of Jesus life and ministry. We see a young John holding a chalice and the image of an eagle. The chalice serves to emphasize the importance of the sacrament, and the pouring out of Jesus blood for us. Throughout the gospel of John, Jesus’ atoning sacrifice is a particular focus and theme. Reflecting on Jesus life later, John could remember everything through the lens of the resurrection, and we see the importance of Jesus’ life here in the chalice. The other detail, the eagle, is very interesting. In Revelation, a book we will talk about shortly, there is a brief section where John describes four winged creatures from his dream. Each of them have come to represent a specific gospel and it’s respective author: Matthew is a man with wings, or an angel; Mark is a lion; Luke is an ox; and John is the eagle. Whenever our eyes fall to this window we are called to remember the Father’s love in Christ Jesus. Like the winged eagle flying high in the sky we look up to the kind of love that Jesus exemplified and strive to live accordingly. The great sacrifice was made so that our joy could be complete in and with one another as we look on eternity without flinching as we journey toward the goal of communing with the Lord. John the Evangelist wrote what he did to remember for us what his master taught him: As the Father has loved me, so I have loved you; abide in my love. Our second window, the one to the right, contains John as the Presbyter. Presbyter comes from the greek word presbuteros which means “elder.” As John grew older and continued to play an integral role in the formation of the early church, it became necessary for him to write letters concerning the faith. In the window we see a mature John with a quill and parchment. Like we still do today, whenever we encounter the struggles of fellow disciples, we strive to help them through their trials and tribulations. For John, having lived with Christ and experienced the true power of the resurrection, he devoted himself to the early Christians and helped them to understand the importance of love. He wrote things like: “Do not love the world or the things in the world.” Only a man speaking from a life of wisdom could make such a statement. The desires of flesh and the prides in riches only serve to destroy us because they wither away. All of the false things that we put our faith and hope in are passing away, but the love of God endures forever and ever. Whenever we glance to this window of John as the Presbyter, we are called to remember the value of wisdom and what it means to grow together. Being Christian is not something that can be done in isolation, but instead can only be fruitful and life-giving if we disciple as a community. John wrote letters to encourage and remind the faithful what it means to be faithful. As disciples we have the responsibility to build one another up for kingdom work. John the Presbyter wrote to Christian communities about what faithful living was all about: those who do the will of God live forever. 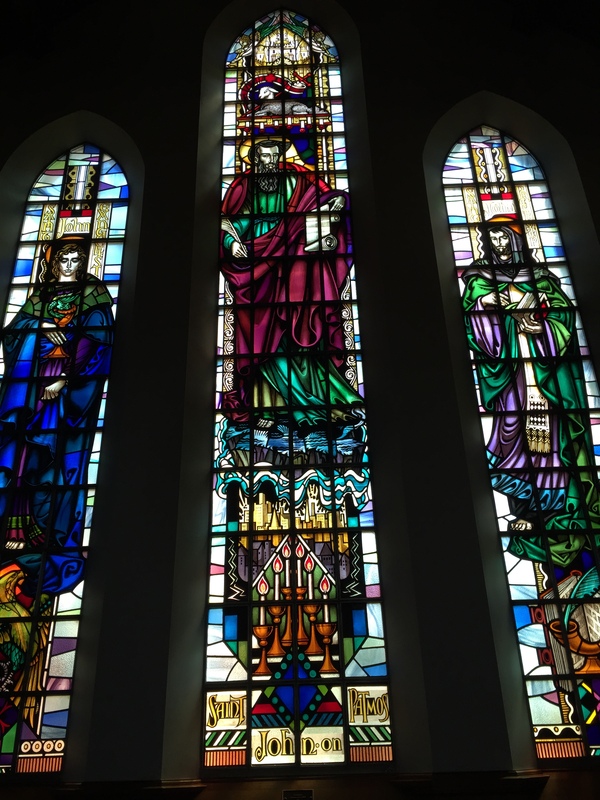 The third window, in the middle, contains John on Patmos. After a life of faith, John was exiled away to Patmos, a small Greek island in the Aegean Sea where he wrote about his visions. The book of Revelation contains fantastic imagery of the way God has, is, and will move in the world. Our final John is older with a fiery city at his feet, and the new Jerusalem above his head with the lamb. The Lord gave John certain visions and told him to write them down because they were trustworthy and true. Our window displays the height of the revelation when God will make all things new. A holy city, the new Jerusalem, will come down from heaven. This is where God will dwell with the people, God will wipe away all of our tears. Death will be no more; mourning and crying and pain will be no more. The first things will pass away because God will make all things new. In our window we see the former things, the earthly passions of the world at the bottom passing away. But God has not, and will not, abandon us to our own devices. The new city at the top will reign and the kingdom will be forever. Whenever our eyes fall upon this window we remember that the Lord is with us now and forever. That even in our death we will come closer to the new heaven and the new earth that the Lord has promised. In the midst of our grief and suffering now we can still give thanks to the Lord for that day when he will make all things new. This window calls us to trust the Lord just like John did throughout his life. John on Patmos wrote down the visions the Lord had provided so that others would come to know what the future holds: The Lord will dwell with us and make all things new. Who are we? A group of Christians who get together week after week to rediscover what it means to follow Christ? A ragtag collection of disciples who need to find a little more light in our lives? If we want to live into our name, then we need a better story than being named by a District Superintendent. If we want to be the St. John’s that God is calling us to be, then we need to reclaim what that name means for us. But we are also more than what we do. Our identity is firmly rooted in the name of John and we should be proud of it. We were named after a man who was called to follow Jesus, remembered the Messiah’s life for other communities, wrote to churches about faithful wisdom, and caught glimpses of future glory. Likewise, we are a community of faith that believes in following the Lord, in sharing God’s story with other people, in teaching those younger in the faith about what it means to love, in celebrating the coming day when God will make all things new. St. John’s; what a perfect name. Amen. For nothing will be impossible for God. Our parsonage is beautiful. 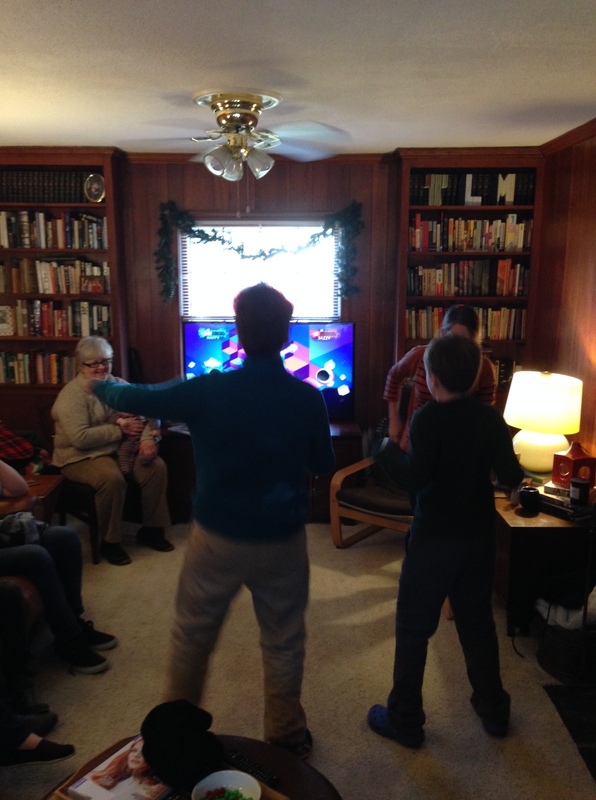 One of the many blessings of serving as a pastor for a United Methodist church is the fact that the local church often provides a parsonage for their pastor and family. I’ll freely admit that I was slightly nervous before arriving in Staunton for the first time because I would have no say about where I was living. Whereas other families can pick and choose a residence based upon their proclivities, I would be stuck with whatever St. John’s provided. However, when I began moving my belongings in, I realized how very fortunate I was. Providing a parsonage is an incredible act of grace and generosity, one that I try to not take for granted. Whenever I pull into the driveway after a particularly stressful day at the church, I give God thanks for the people of our church community and their willingness to provide such a wonderful gift for my family. I am proud of the parsonage and I look forward to the changing seasons as an opportunity to adorn the house with different holiday elements. Yesterday afternoon, my wife and I invited everyone from the church community for an open house at the parsonage. Part of our decision was born out of the fact that the parsonage belongs to the church, and we wanted to express our thankfulness for their generosity. (The other part of our decision was born out of the fact that Lindsey talked me into purchasing two Christmas trees this year, and she wanted to show off all of our ornaments.) We worked hard last week to clean and organize everything, prepare an abundance of food, and open our house to those near and dear to us. At some point during the open house, I was struck by how remarkably blessed we are. In such a short amount of time Lindsey and I have been so welcomed into the local community, and to be surrounded by our church family was a humbling experience. I looked around and saw the people I have prayed with, and for, on a regular basis, I saw the children I have baptized, I saw the individuals I have counseled, and I saw God’s love manifest in the gathered people. I have known for a long time that I felt called to be a pastor, but I never imagined that it would feel this incredible and graceful. I thought that being part of a loving community to this degree was impossible. But nothing is impossible for God. The feelings that I experienced yesterday were only possible because of the incredible gift that God gave us in Jesus Christ. Without the impossible possibility of God coming in the form of flesh as a baby in a manger we would not have such a loving community. Without the impossible possibility of God’s unending love and grace, we would not see one another as precious gifts. In these few remaining days of Advent, I encourage you to look around at the blessings in your life, give thanks to God for the gifts that you have been given, and remember that nothing is impossible for God. You remember our labor and toil, brothers and sisters; we worked night and day, so that we might not burden any of you while we proclaimed to you the gospel of God. All Saints’ Day is a strange celebration in the worship life of church. 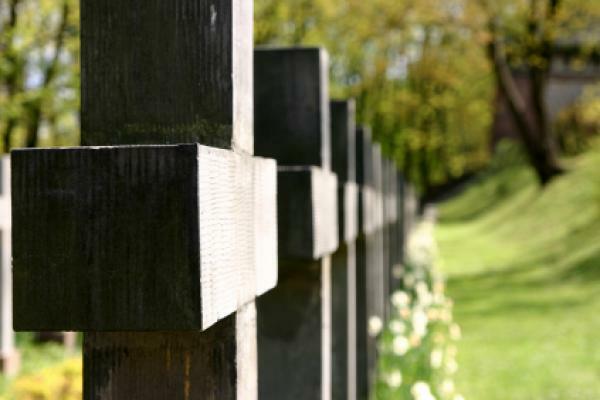 As United Methodists, we will gather together next Sunday to remember those who have gone on to glory; we will honor their lives, deaths, and promised resurrections. For a young pastor the celebration of All Saints is one that I look forward to in order to help the still grieving families mourn appropriately, but it is also a sacred day of privileged preaching that cannot be taken lightly. I have been a pastor for 1 year and 4 months. It has been a tremendously rewarding experience thus far, and I continually feel that I am exactly where God has called me to be, and doing what God has called me to do. Throughout the first year, no one died in our church community. (They tell you in seminary to prepare yourself for a funeral your first week in the church; but for me that did not happen) We celebrated some incredibly special moments together in worship: baptisms, professions of faith, weddings, confirmation, the Eucharist. But we did not gather together for a funeral. While so many of my clergy colleagues felt fatigued under the tidal wave of death that was striking their local churches, I felt guilty for making it through a year without having to do a funeral. Over the last few months, however, we have lost 6 church members in quick succession. While sitting with families in the deep and dark moments of planning a funeral after the loss of a loved one, I was also worried about someone that had just entered the hospital, or received a bleak diagnosis. Death, it seemed, had caught up with us. Church is often made out to be a place of sacred happiness where people can discover an element of joy and grace that they might not otherwise find. Yet at the same time, the church is one of the last arenas of reality. It used to be that people feared having a quick death. They did so because they feared dying without having the time to be reconciled with their enemies, who were often members of their family, the church and God. Today we fear death. They feared God. All Saints is a time for us to remember the great promise that God made with us when Jesus was resurrected from the dead: that we are not alone and that Christ has defeated death. This does not mean that we will not die, but it means that death is not the end. As we prepare for All Saints’ Sunday, let us remember the “labor and toil” of those who have gone on to glory, those who “worked night and day, so that we might not be burdened while we learned about the gospel of God.” Let us remember our own finitude and give thanks to God for not abandoning us. And let us praise the Lord who defeated death so that we might have life.